LB Foundations were very pleased to compete the recent Saturday night railway possession works for Expanded as part of the Edinburgh Trams Project. 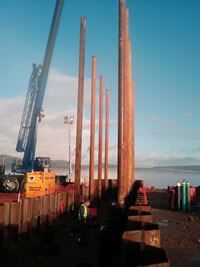 LB Marine have successfully completed the installation of rock socketed tubular piles for RNLI's new berth at Portpatrick. 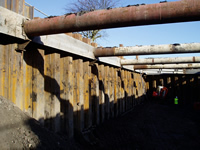 LB Foundations have completed a further section of sheet piling on the Edinburgh trams project using silent, vibration free equipment. Chris Russell would like to thank all contributors to his charity swimathon and 50 mile bike ride during May. Charities' Sport Aid and Chest, Heart and Stroke Scotland benefited to the sum of £250. Chris also shed a few pounds ! 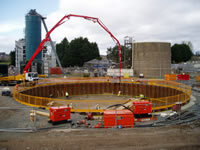 LB Civils is the umbrella representing LB Foundations Ltd and LB Plant Hire. The combined resources and experience of all the LB companies put us at the forefront of the construction industry as a leading specialist contractor. Our expertise is in piling, ground support and specialist contracting, we are proud to offer engineered solutions to our clients. LB were established in 2004 with the formation of LB Foundations Ltd, a specialist piling and ground support contractor, and LB Plant Hire which provides plant and equipment to the construction and agricultural industries. Both companies have grown to establish a significant market share within Scotland and Northern England. All companies take pride in being owner and engineer lead, providing a high quality service and engineered solutions to our client bases. Our success and period of continual growth has allowed significant investment since the establishment of LB. The resources available to all companies with respect to plant, equipment, stock and personnel allow a highly flexible approach to be taken on optimum solutions, lead in/construction durations and workscope. Investment in our workforce has also enables us to achieve and maintain 100% CSCS/CPCS card holders in recent years. More detailed information is available on each company by following the links above. Site designed, developed and delivered by futurist online ltd.